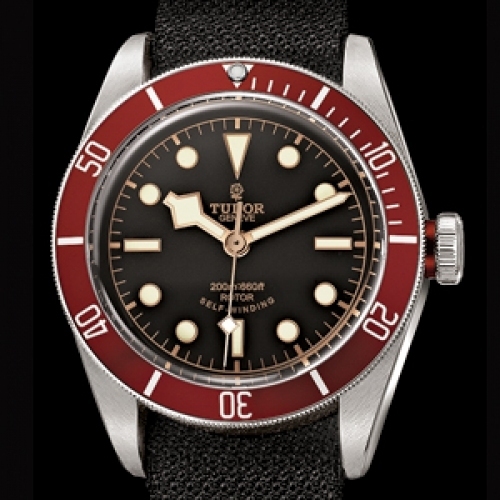 Introduced in 2010, the Tudor Heritage collection is home to the brand's iconic models revisited to meet the latest stylistic aspirations. 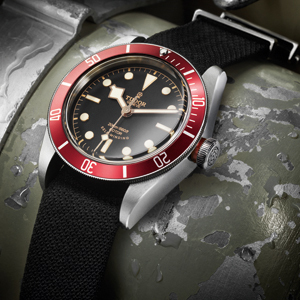 The Heritage Black Bay is the perfect example with its curved black dial - a fabulous vintage touch -, striking burgundy bezel and snowflake hands, all three inspired by the iconic, early dive watches of the 1950s. The long, slender lugs of the original model have been supersized to match the contemporary 41 mm steel case that is water-resistant to 200 metres. The pink gold of the hands and hourmarkers adds a hint of nostalgia by suggesting the distinctive patina of older timepieces. With characteristic attention to detail, the same burgundy circles the insert for the winding crown, which is engraved with the Tudor rose.